January 8, 2007: If you think in pounds and miles instead of kilograms and kilometers, you're in the minority. Only the United States, Liberia, and Burma still primarily use English units -- the rest of the world is metric. And now the Moon will be metric too. NASA has decided to use metric units for all operations on the lunar surface when it returns to the Moon. The Vision for Space Exploration calls for returning astronauts to the Moon by 2020 and eventually setting up a manned lunar outpost. The decision is a victory not only for the metric system itself, which by this decision increases its land area in the solar system by 27%, but also for the spirit of international cooperation in exploring the Moon. The decision arose from a series of meetings that brought together representatives from NASA and 13 other space agencies to discuss ways to cooperate and coordinate their lunar exploration programs. Standardizing on the metric system was an obvious step in the right direction. "When we made the announcement at the meeting, the reps for the other space agencies all gave a little cheer," says Jeff Volosin, strategy development lead for NASA's Exploration Systems Mission Directorate. "I think NASA has been seen as maybe a bit stubborn by other space agencies in the past, so this was important as a gesture of our willingness to be cooperative when it comes to the Moon." 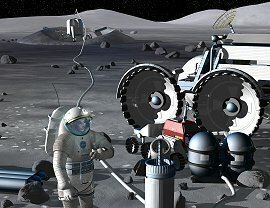 The meetings, which began in April 2006, included representatives from the Australian, Canadian, Chinese, European, French, German, British, Indian, Italian, Japanese, Russian, South Korean and Ukrainian space agencies, all of which are either planning or considering some form of lunar exploration. "Of course there's some competitiveness and national pride involved," Volosin says, "but we want to find areas where our goals overlap and see if cooperating in certain areas would be best for everyone." Going metric was one of those areas. Agreeing to use a single measurement system will make the human habitats and vehicles placed on the Moon by different space agencies more compatible with each other. That could come in handy if, say, one agency's moonbase needs emergency spare parts from another agency's base. No need to worry about trying to fit a 15 millimeter nut onto a 5/8 inch bolt. Emergencies aside, a metric standard will make it easier for countries to form new partnerships and collaborations after their lunar operations are already in place. All data will be in compatible units, whether it's scientific data or operational data -- such as how far a rover must travel to reach the edge of a crater. A single measurement system will make sharing this data and merging operations more seamless. Although NASA has ostensibly used the metric system since about 1990, English units linger on in much of the U.S. aerospace industry. In practice, this has meant that many missions continue to use English units, and some missions end up using both English and metric units. The confusion that can arise from using mixed units was highlighted by the loss of the Mars Climate Orbiter robotic probe in 1999, which occurred because a contractor provided thruster firing data in English units while NASA was using metric. NASA is considering adopting other standards for its lunar operations as well. For example, another idea that has been discussed informally by the space agencies is using the same type of internet protocols that we all use here on Earth today for communications systems developed for the Moon. "That way, if some smaller space agency or some private company wants to get involved in something we're doing on the Moon, they can say, hey, we already know how to do internet communications," Volosin says. "It lowers the barrier to entry." In all, this push toward standards and cooperation gives the return to the Moon a very different feel than the Cold War space race of the 1950s and '60s. This time around, competition may help motivate nations to reach for the Moon, but cooperation will help to get them there.